What is a Referral Service Business? A referral service business or agency is basically a service where you have a toll free number people can call and get a phone number and information on what you are referring. Have you ever heard of 1-800-Dentist? You call up and they refer you to a local dentist in your area. These dentists PAY to be on this list. You can do the EXACT same thing with a local referral service and make very good money doing it! You will need to first decide what you want to refer. Here are some ideas to think about: Daycares, doctors, realtors, restaurants, dentists, loan companies, photographers, etc etc. You can refer almost anything you want! And now that the internet is booming – you can create a mobile-friendly website to go right along with your toll-free number, or even go web-only if you want. But first things first, before you even begin to think about creating this super, awesome referral service business, you need to grab a pen and paper, or iPad… or whatever it is you take notes on and brainstorm. You need to decide what your niche is going to be. Below is a list to just help you begin your brainstorming. Just think about everyday things you're personally looking for or that your friends have mentioned they are looking for. Maybe you know for a fact it's hard to find a good plumber and want to just focus on plumbers. Or maybe you had a bad car-towing experience and want to make sure no one else does. Some niches might be super limited in your area. So keep in mind a business that will have several potential clients. Once you decide on what you want to refer you need to market your referral service. I recommend getting a toll free number established first, so you can show your clients you are ready for business. I recommend charging anywhere from $10.00 to $20.00 per month. You can bill in three, six or twelve-month increments. If you had 50 companies sign up at $10.00 per month that is an extra $500.00 a month! Make business cards with your referral service name and a catchy flyer. Visit the store owners personally, show them that it is cheaper then advertising in the phone book! Have them sign a contract, pay you up front and get all the information you need. If it is a daycare center, get the prices and address. Everything you might need to give a solid referral! Once you have clients advertise the service. Put an ad in the phone book and newspapers. Pass out flyers through the mail. Then get ready to work! Decide on the hours of operation. Watch out because your clients will call you and check to be sure you are answering the phone and offering referrals! Of course, like I said earlier — with the internet really taking over almost every medium – having a website and one that is responsive (meaning mobile ready) is a must-have in my opinion. But offering web-presence and toll-free service, this means clients get more bang for their buck and you have more to offer as well – which can only mean growing your business in a positive direction. There are websites out there like this now to give you an idea – right off the top of my head I think of Care.com, Service Master and Angie's List. But that doesn't mean there isn't room for a local referral service type website for your town or city – even your state. Maybe you want to refer realtors? Maybe you want to refer bed and breakfasts? Whatever the case may be – you can certainly geared toward that specifically and then grow outward if you see the kind of success you hope for. As well – you could always look into a welcome service business or greeting service for new residents. I've always thought a greeting service would be a fun business. Making people feel welcome and helping promote local businesses in an old-fashioned, genuine type way just appeals to me. If you're looking for other business ideas, be sure to check out the list I've created over the years here: Home Business Ideas. You might also want to check out the huge Direct Sales Companies Directory here to see all the latest home party plan and direct sales businesses. More than enough info…to get started….Thanks! God Bless…. Why is anyone asking the author of this article for more information on a referral business? The information is in the article people;the rest is up to you! I am a work at home mom w ho is home schooling her special needs child and need a job to make money for a single parent home. Please send me more information regarding Starting a Referral business. The only info I have right now is in this article. 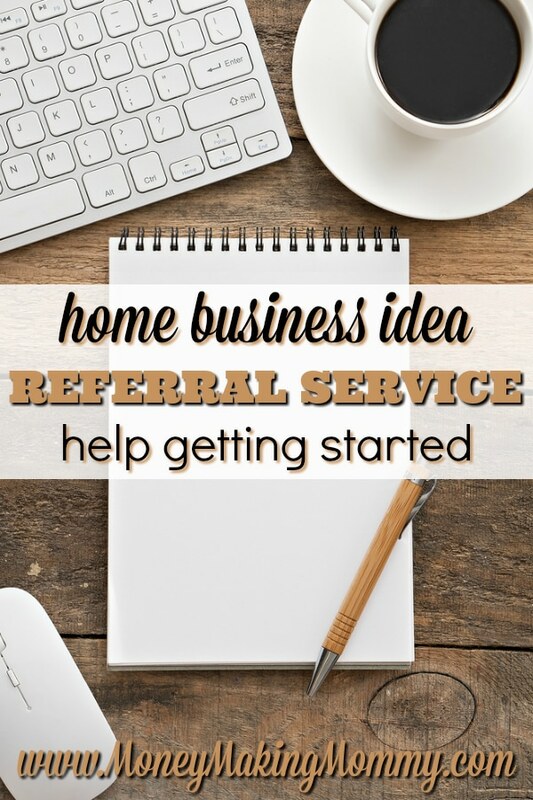 Please send me more information about starting a home base referral business. I have tried several times to download the eBook but for some reason it never downloads. I would like information on starting a referral business; can you please send me information. Can you please send me info with regard to starting my own referral business. Thank you. I would like information on starting a referral service..but i have niche and am not sure how to bill for services.